Regardless, we’ve all had experiences with people who mooch from us. They drain our financial resources and patience, and oftentimes, they test the limits of our generous spirit and goodwill. How can we protect ourselves from these financial vampires? Read on for advice on how to stop someone from mooching. One easy solution is to distance yourself from the mooch. However, it may not be that simple. If you are related to this person, you may not be able to escape the problem in such a straight forward way. If you’ve been friends with this person for many years and you get along on every other level, you may want to maintain the relationship. So, if you don’t want to remove this person from your life, what can you do to protect yourself and your finances? Here are some ideas to get you started! Before you can set boundaries, you will need to figure out what you are comfortable with and what you will not tolerate. Perhaps you are willing to spring for the occasional dinner out, but you will not invite ‘the mooch’ to your house for meals as you know that she will not offer to bring anything and will probably raid your fridge after dinner. Recognizing that you are uncomfortable with what has been occurring and then figuring out your tolerance level is important. You may also be worried that you could lose the relationship if you are honest with this person. However, I’m here to tell you that if you don’t figure out a way to deal with this issue, your relationship will not survive. You will either become fed up with being used, or, you will continue to be drained financially and otherwise. Explain yourself in a calm, non-accusatory manner – but be honest. You’ve reached your limit and that’s okay. 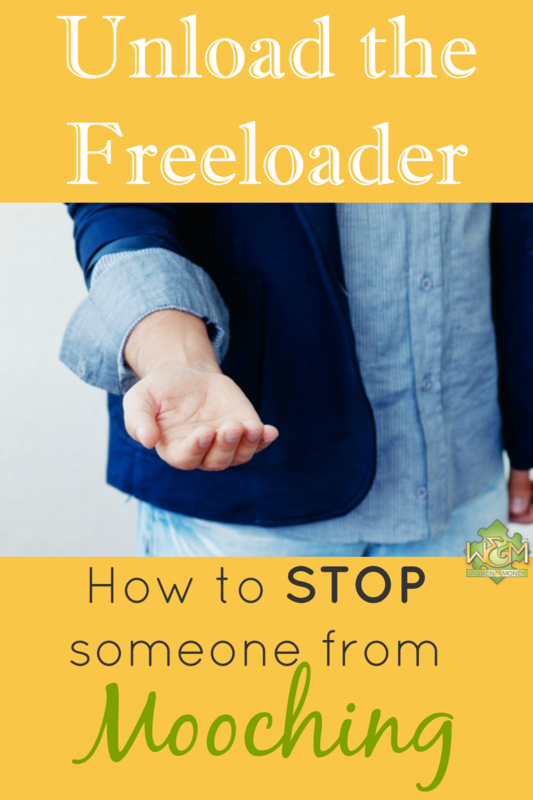 You might feel obligated to explain yourself to the freeloader, because ‘suddenly’ you do not want to pay for their meals, take care of their kids, or give them access to your pantry or closet. It is important that you acknowledge that this is not a new way of thinking/feeling for you. You have felt taken advantage of for a while now and it needs to stop. You can explain your feelings to the other person without blaming or shaming; after all, you allowed this behaviour to continue, and perhaps, you even encouraged it on some levels. Maybe money is tighter for you now than before because you are on maternity leave or because you and your partner are testing out new lifestyle choices (minimalism, frugality, etc). Perhaps you noticed that because you’re so busy looking after other people’s kids, you hardly have time with your own. Whatever your reasons, you have a choice to share them or keep them to yourself. Don’t let anyone make you feel obligated to share your feelings if you don’t want to. To prevent mooching, you will need to figure out how you can share the financial responsibility with this person. Maybe you will only invite her over if you are having a potluck and explicitly tell her a specific item to bring. If you are carpooling and he never gives you gas money, you could suggest alternating driving days. If you regularly watch your friend’s kids, ask if she can watch your kids so you and your partner can go out on a date. Brainstorming ways for you to share the load (and not feel pressure to give more than you take) is essential to halting freeloading. Many of us feel guilty for not giving more. We think to ourselves, “I have so much, what I can give to others?” It is too much of this type of thinking that has put you in this position. Yes, you may have more than enough – money, support, time – but that doesn’t mean that you have to give it all away. You do not have to shoulder everyone’s financial burdens simply because you are self-sufficient. You may know a lot of people who are in worse financial shape than you are, but that doesn’t mean that you are responsible for their well-being or happiness. You are responsible for you. Plan ahead to avoid awkward exchanges or tension. Imagine that whenever you go out to eat with a friend, the cheque always arrives in a single bill. Then, you both awkwardly reach for it, and she says that she will pay. You, knowing that she is going through that nasty divorce, feel uncomfortable with the idea, as she is tight on cash. You make good money, shouldn’t you spring for her meal and drinks? No! At the start or the end of the meal let the server know that you would like separate cheques. This sends a clear message to your friend without being rude or awkward. If your sister calls you to look after her cats every time she goes on vacation (even though she lives about 45 minutes away), let her know that it was a one-time thing, and give her a referral to a cattery in her city. Being firm isn’t the same as being rude – don’t confuse the two. It is entirely possible that the ‘moocher’ is unaware of their freeloading ways. Some people are naturally very generous, and others, well, are a bit more reserved in their giving. Perhaps this person has misread your financial situation and assumed that you have the ability or desire to give freely. Maybe this person is extremely frugal and achieves this lifestyle through taking advantage of other’s generosity. It is very likely that the moocher isn’t aware of your own financial struggles or concerns. Whatever the case, it is important that if you want to maintain a relationship with this individual, you must learn to forgive them for their past indiscretions. If you cannot let go of your resentment, then perhaps that is a sign that you must let this person go. Most situations with moochers can be resolved by sending clear signals. The adage that people aren’t mind readers (except for actual mind readers!) is true, and they shouldn’t be treated as such. Be clear, strong, and thoughtful in your exchanges, and I’m sure you’ll be successful in maintaining your relationships! Do you have experiences with people who mooch? How have you handled it? Share your tips on how to stop someone from mooching!